High-efficiency filters are designed to capture particle dust and various suspended solids below 0.5um as the final filtration of various filtration systems. 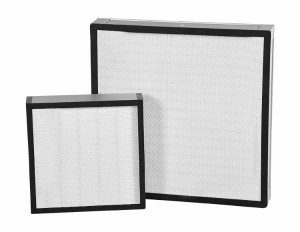 High-efficiency filters are very expensive, in order to protect them and ensure filtration systems working smoothly, we suggest changing low-efficiency filters every month and replacing the medium efficiency filters every 3 months, which can guarantee the service life of the high-efficiency filter for 5 years (or even 10 years). But if hydrofluoric acid is found in the workshop, and filter paper are easily corroded in some cases, high-efficiency filters must be replaced regularly. In some large pharmaceutical factories, high-efficiency filters are to be replaced after the rainy season every year, so as to prevent any possible fungal contamination on the filter. Some biological laboratories and laboratories dealing with dangerous things require new high-efficiency filters for reliability before launching new important subjects. High-efficiency filters are composed of fiberglass and possess diameters between 0.5 and 2.0 micrometers. 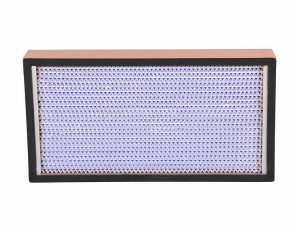 High-efficiency filters include mini pleat HEPA filters，separate HEPA filters, HV high volume HEPA filters, ULPA filters and so on, all of them can be founded and manufactured in our factory. We have introduced the most advanced automatic production line for high-efficiency filters, mixing glue machine, professional filter production equipment. In terms of test equipment using the world first-class brand of laser high-efficiency air filter of dust particle counter scan test bench, which keep us competitive to won customers all over the world.